Modernisme et compréhension: polémiques: revue d'art was a magazine edited by Alfreyd O. Montagne and Ené de Piro and published in two(?) issues in Paris in 1917. 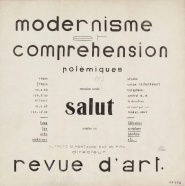 Modernisme et compréhension 1 (1917). 25 cm. Download. 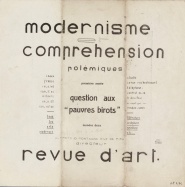 Modernisme et compréhension 2 (1917). 25 cm. Download. The above PDF is sourced from Bibliothèque Kandinsky. This page was last modified on 9 August 2014, at 13:59.